A flood of rumors about the Samsung Gear S4 smartwatch recently crossed our desks, and we passed them along to you right away. For example, earlier this month we heard that the timepiece, reportedly code named Galileo, will be offered in two sizes. The LTE version of the device is supposedly going to be available from Verizon, T-Mobile and AT&T. A fresher rumor that we passed along just a couple of days ago, suggests that Sammy's new smartwatch could carry the Galaxy name and be pre-installed with Wear OS. The latter is the operating system for wearables that was formerly known as Android Wear. That report appears to have been backed up by a tweet disseminated today by Hall of Fame leaker Evan Blass. 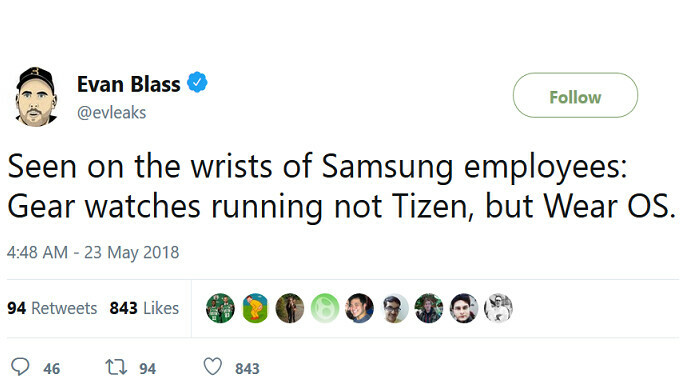 According to Blass, "Seen on the wrists of Samsung employees: Gear watches running not Tizen, but Wear OS." The watch is expected to be unveiled in the second half of this year. It is possible that Samsung has decided to put a fork in the road and will continue to offer Tizen powered Gear branded watches while launching a new line of Wear OS Galaxy wearables. However, if we take Evan's tweet at face value, Samsung could be keeping the Gear name and merely replacing Tizen with Wear OS. It's not like Samsung has never stuffed Android into a smartwatch before. Back in 2013 (only five years ago in calendar terms, but light years away in terms of technology), Samsung introduced the Galaxy Gear timepiece, which ran on Android. Two years later, the Samsung Gear S2 was released with Tizen running the show. I’m all for it as long as the rotating bezel is still in effect. Tizen on the Gears was a good idea that unfortunately never was realized, the horrible app selection being proof positive. Already have a few watches, but would love a Gear S3 with Wear OS and the rotating bezel. Should be no problem, Wear OS supports both rotating bezels and digital crowns. Apps on a watch? Which specifically are critical? Hahahaha, good question; Google Keep, I check my shopping list on the watch instead of holding my phone while buying grocery. I use it mainly for answering messages (on several platforms) in certain situations. Google Keep is great to use. I also use Auto-voice/Tasker to use my watch to control home automation. Don’t be salty because Tizen offers a horrible app selection compared to what Apple and Google offers for their wearables. Not salty just curious seeing as people are not buying any smart watches for apps. His comment wasn't even 'salty', he was asking a genuine question. It wasn’t a genuine question, unless he’s legal impaired and not fully lucid, he’d have to know app selection is a big part of a smart watches appeal. He asked which ones are critical, which you didn't answer, but rather attacked him. Of course app selection is a big part of smartwatch appeal, but which ones are truly so needed that Samsung is potentially scraping their own OS to move back to Wear OS? The only real benefit I see is that it will play more nicely with phones that aren't Samsung...in which case, just release one with Tizen and one with Wear. Yes please but ONLY if its a stainless steel version, black sporty look is not for the majority. Dont care about LTE. If they switch to Wear OS then they better provide an update for older watches like Gear S3 and Gear Sport. I like Tizen but Wear OS has better developer support. Yeah I prefer Tizen. I had Moto 360 Gen 1 & 2 and then switched to Gear S3 and it is superior, in my opinion. As long as Samsung keeps Samsung Pay, all is good. Samsung Pay with MST is a game changer. I use my watch for Samsung pay as much as I use my Note8 Samsung pay. Gear OS is a bit quirky but better than Wear OS. Samsung giving up on Tizen? Guess this OS will never replace Android on the flagships.